In a large pot, heat olive oil over medium-high heat. 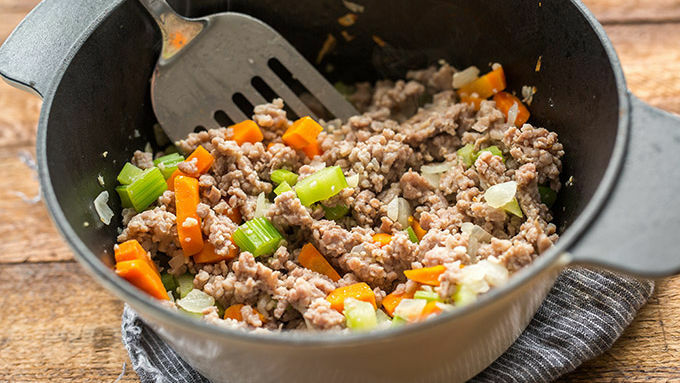 When oil is hot, add sausage, carrots, celery, onion and garlic to pot and cook, stirring occasionally, until sausage is cooked through and onion and garlic have softened and become fragrant. Add beans, pasta, broth and tomatoes. Stir until well mixed. Cover and cook for 15 minutes, or until pasta is al dente. Salt and pepper to taste. Serve topped with Parmesan and fresh parsley. When my oldest son got his first job at a certain Italian joint down the street, the little bros and sisters melted into joyful chanting of “Soup, salad, breadsticks! Soup, salad, breadsticks!” It was as if they forgot that mom wasn’t actually going to take them out to eat every day, simply because we now had a family discount. When I broke the news to them, they were vaguely disappointed, but the big brother treated them to enough meals with his own paycheck that most everyone was at least mildly contented. When I suggested we try to hack a few of their favorite menu items at home, everyone was all in. The next best thing to having a brother that works at OG? Having a mother who copycats OG classic for dinner. And so, we set to work. First up? Soup and breadsticks, of course. 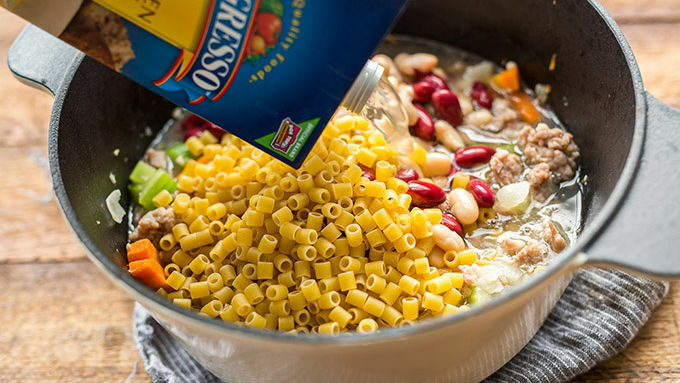 For the soup, I decided to make the Pasta e Fagioli (or “pasta and beans”), and once I started breaking down the ingredients, I was delighted to discover that it’s surprisingly easy to make at home. Maybe even easier than getting the crew into the car, driving five blocks to a restaurant and ordering the stuff ourselves. 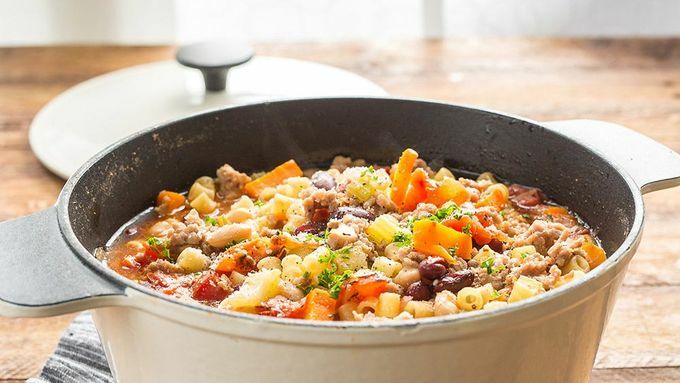 A quick cook of ground sausage in a pot, all sorts of easy-to-find canned ingredients added. Then add ditalini pasta and boil until tender. Boom. 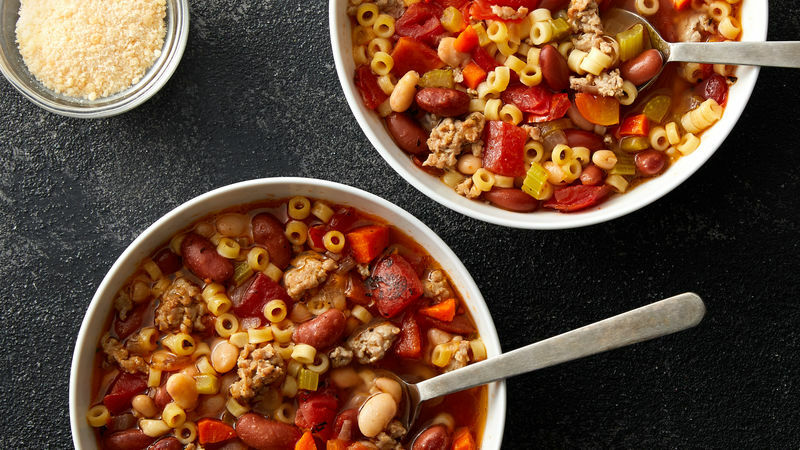 (Fun fact: “ditalini” means “small thimbles.”) Fifteen minutes later, the whole fam was gathered around a steaming pot of Pasta e Fagioli, dipping buttery breadsticks inside, and calling me Best Mom Ever. I’d call that a dinner win. Speaking of those breadsticks: Since I have exactly one minute of my life to actually share with yeast-based, from-scratch baking, I just nabbed a tube of Pillsbury breadsticks, drizzled the dough with a stick of melted butter, topped that with more fresh-grated Parmesan than the entire country of Italy has ever seen, baked them until golden, and called it a day.